Now I know what we'll have for dinner this weekend. When I cook a chicken, I normally use salt, pepper and some dijon mustard, but this time I'll try the thyme. I just slaughtered a nice 3 pound chicken that would be perfect for this recipe. Thanks for posting. Hey Greg, I should mention the recipe in the Bouchon cookbook is not the same as what I did. The one in the cookbook is more the restaurant version, with a brine, etc. That is a gorgeous roast chicken! I love that it cooks quickly! 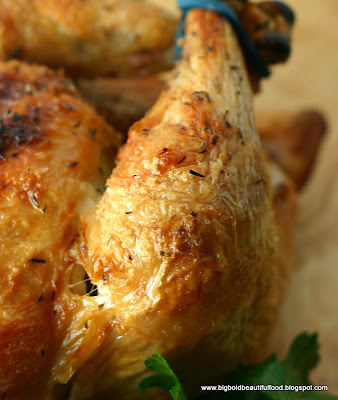 It makes it so easy to do this at home rather than pay for over-priced rotisserie chickens. 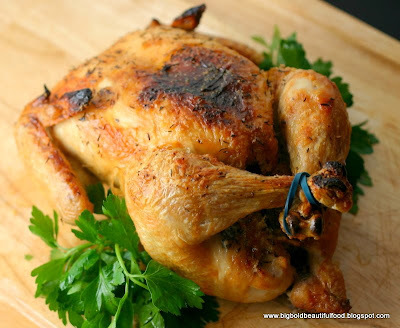 I love whole roasted chicken - my store routinely carries Purdue's chickens for .99 a pound - but I do tend to buy the biggest one - with the leftover chicken I make chicken enchiladas, then use the carcass to make chicken noodle soup. I just made soup out of the carcass for lunch. Wise daughter and I have been home sick for two days, maybe with the oink oink flu. 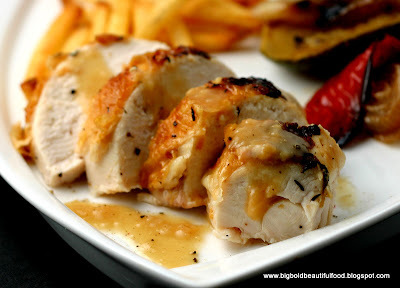 This looks really good and perfect for a fall dinner! I just got some organic pepper and Himalayan sea salt from Sustainable Sourcing https://secure.sustainablesourcing.com and I think I'll try them both out in this recipe. Thanks for sharing! Just popped in from Food Rave. I enjoyed my visit immensely. Your chicken recipes sounds most appetizing and it looks, dazzling!!! Thank you for sharing, I have to go now but, Bookmarked!!! Oh wow! This is my absolute favorite recipe. I make this at least once every couple of weeks. My chickens are usually tiny, around the 2lb. mark, and I swear, I could easily eat the whole thing myself in a sitting! Hey Daisy Girl. No, you don't have to cover it with anything. Just put it in a roasting pan and cook away. Note that it will make a mess of your oven, but it's worth it. I just found your blog after typing in TK roasted chicken. I decided to try his way after perfecting my chickens the Julia child way. I couldnt get this chicken to turn a "beautiful brown". It did taste great. It must have been the chicken because I had minimal juices. I did make a great pan sauce though. I loved your comment about having to clean the oven afterwards. I set my smoke detector off for the first time in 2 years. 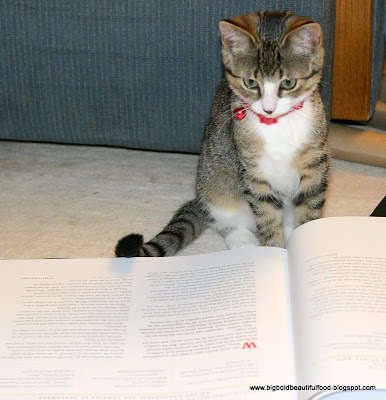 I am going to bookmark your blog. Cindy, thanks for stopping by and trying TK's chicken out. I'm surprised the skin didn't turn brown. Did you dry it off beforehand? Glad it tasted good! It sat out to room temp, salted, hot hot oven. I have only been able to get that gorgeous look with basting, but it was moist and tasty, and I dont eat the skin anyway. There is always another chicken in my future. I make a roasted chicken once a week.